Controversial Australian Nick Kyrgios has been called a "genius" by former British Fed Cup captain Judy Murray, who is "surprised" no other players follow his lead. "The underarm serve," Murray wrote on Twitter, accompanied by a heart emoji. "The whole point of tennis competition is to disrupt your opponent's game by applying pressure through changing the speed, spin, direction, depth or height of the ball. And that includes the serve." Which unsporting behaviours rankle most with you? The comments by Murray - mother of three-time Grand Slam champion Andy - prompted debate on social media, with Belgian world number 56 Kirsten Flipkens backing her stance. It was not the first time Kyrgios has produced an underarm serve, a tactic seen as not in the "spirit" of the sport by many. Last month, after he used it in his victory over world number two Rafael Nadal at the Mexican Open in Acapulco, the Spaniard accused him of "lacking respect" for his opponent and the crowd. "I loved it, I loved every single bit of it. 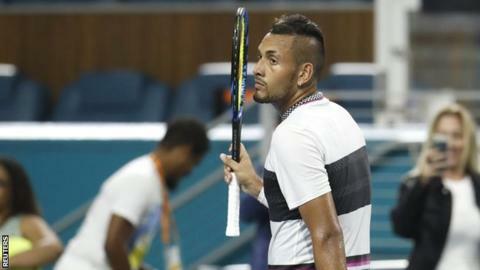 I think the crowd loved it," said Kyrgios after Monday's win in Miami. The underarm serve has long been a point of disagreement in tennis. In 1989, 17-year-old Michael Chang used an underarm serve at the French Open against then-world number one Ivan Lendl - a tournament the American teenager went on to win. Australia's Bernard Tomic used an underarm serve on match point in an exhibition match against Kyrgios in January. Kyrgios used it the same day Rajasthan Royals and England cricketer Jos Buttler was controversially run out by Kings XI Punjab bowler Ravichandran Ashwin while backing up at the non-striker's end in the Indian Premier League. Rajasthan were 108-1 in the 12th over of their chase when Kings XI captain and India spinner Ashwin stopped in his bowling action and ran out Buttler as he left his ground at the non-striker's end.